Special thanks go to retired West Yorkshire Police Inspector, Kevin Robinson, who shared his wealth of knowledge with me and helped me check the police procedural detail in the story with so much patience. There are many things that I loved about this book. The author’s sense of humour really shines through in this book. I don’t usually find the circumstances surrounding a murder to be humorous but I couldn’t help it with this one. The murder victim was discovered in the courtyard of Gemma’s tearoom with one of her scones shoved in his mouth. I didn’t feel too badly about him as he was such a nasty character to begin with. I loved that Gemma wasn’t the only amateur sleuth trying to solve the murder. The ‘Old Biddies’ proved helpful on occasion and more often a source of hilarity. Gemma’s mother is also a great, eccentric character. Between her matchmaking schemes and forever forgetting her Ipad password she injects another layer of humour into the story. I liked the romantic subplot in the background of the story. I’m not sure Devlin deserves to have a second chance with Gemma this early in the series so I was glad that she has other options to play with. I hope Devlin suffers a little bit before/if they end up together. This is the perfect recipe for a very funny murder mystery. H. Y. Hanna took a generous helping of characters. I loved the little old ladies. Added a belly full of laughs. My favourite character has to be Gemma’s mum, who made me cringe and laugh all at the same time, and of course Muesli the cat. With a good dose of eye candy, in the way of the tasty detective and doctor. Whisked them all together, to be devoured at leisure. It all works beautifully. Gemma has lived up to everyone else’s expectations in her life. She has done University. She has had the very well paid job, but she hated it. Now she has returned to the Oxford area and ploughed all her savings into buying a quaint Tearoom. The only draw back is she has had to move back in with her dad and well meaning mum. 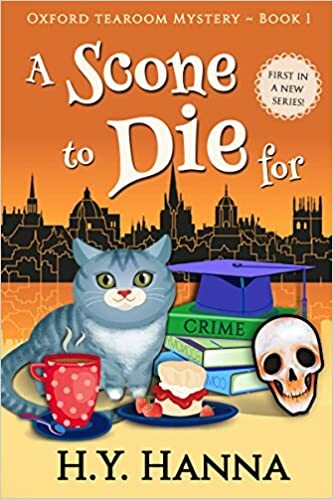 Everything takes a tumble when after an argument with a mouthy American customer, Gemma finds him dead inside the Tearoom the following morning. Murdered by scone!